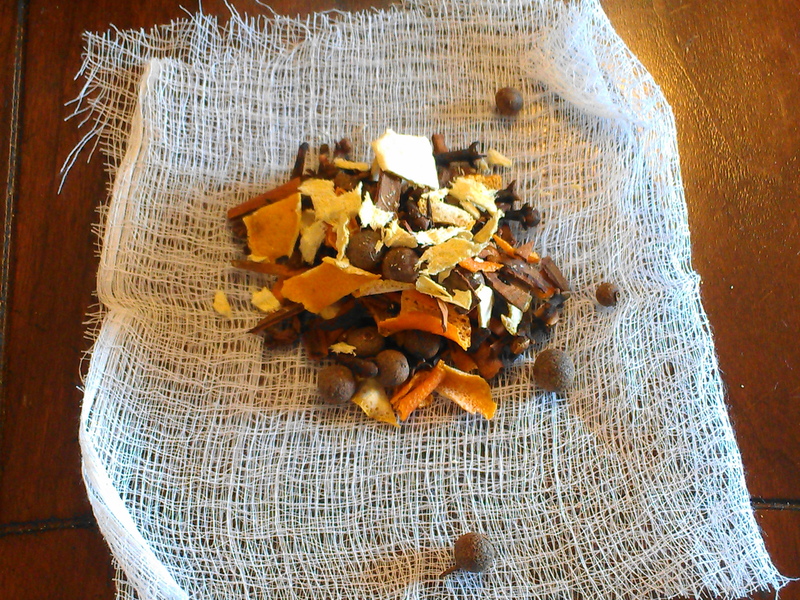 These mulling spice mixes are easy to make and you can assure the freshness of all the flavors involved. To make small mulling packets to give as gifts, follow the recipe below. 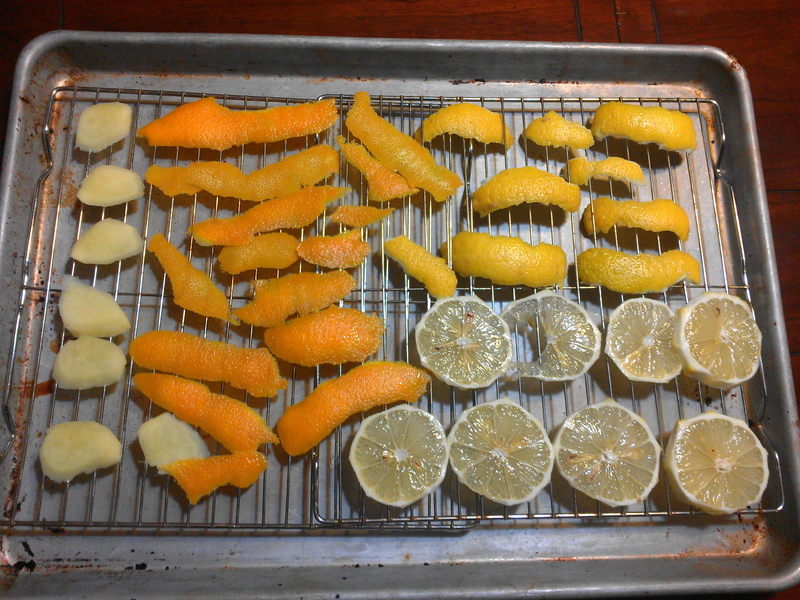 Dried orange, lemon, and ginger pieces. 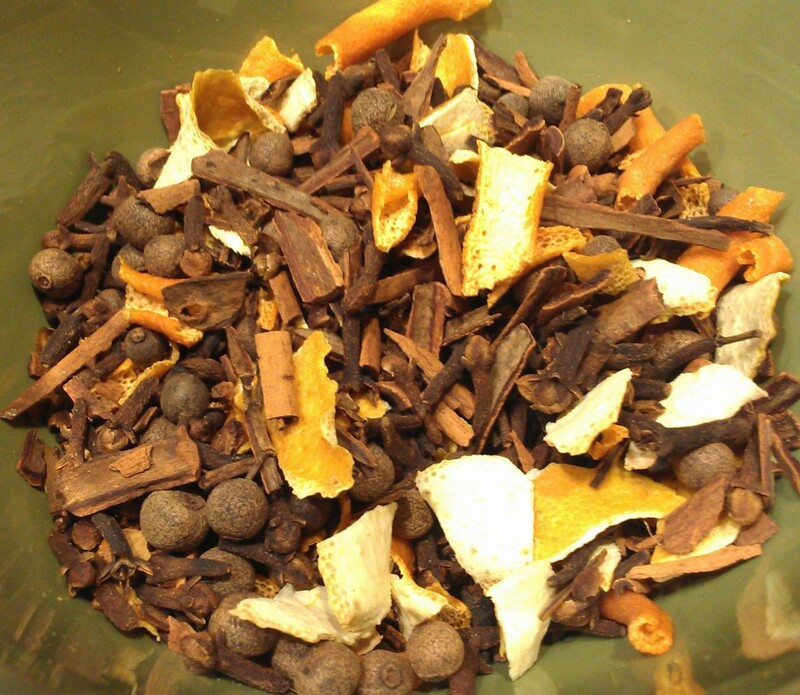 Break ginger, rinds and cinnamon sticks into small pieces. 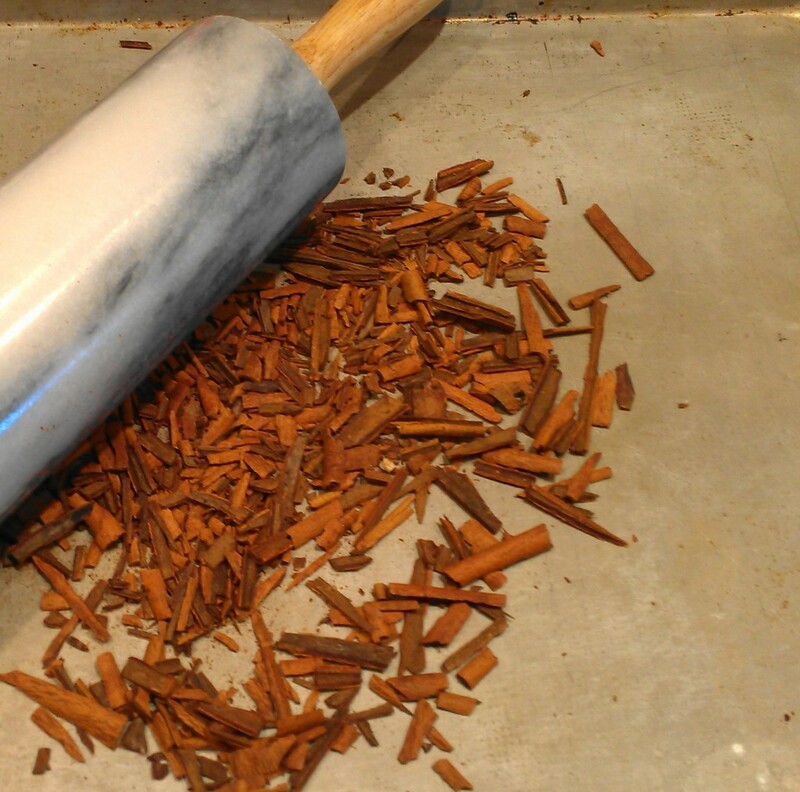 The easiest way to break the cinnamon sticks is to place them on a rimmed baking sheet and use a rolling pin. Scoop one-quarter of the mix onto center of a four-inch square of double thickness cheesecloth; bring ends up and tie with string. Repeat with remaining mix with three more squares. *Watch the rind peels carefully. 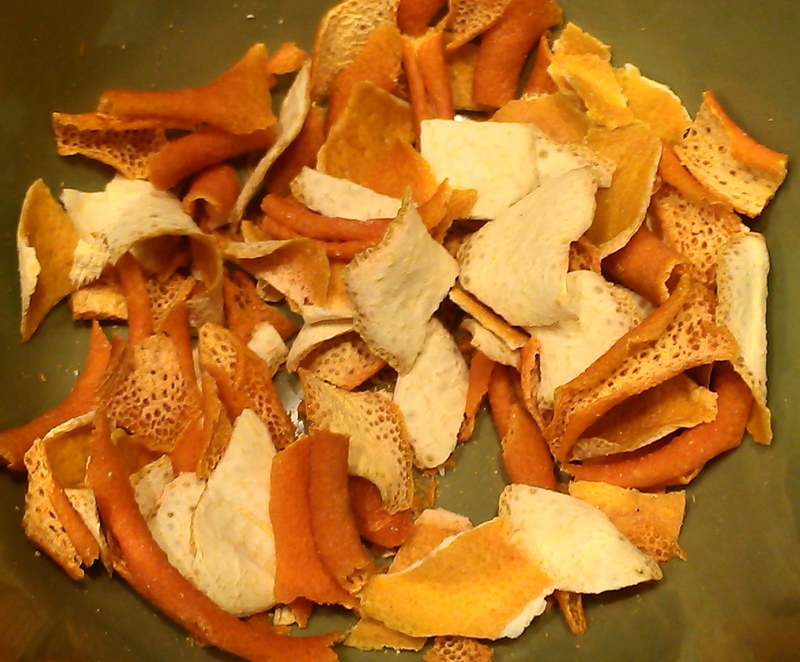 I pulled out my orange peels after only one hour. The lemons (which were a bit thicker) too longer but I pulled them early as well. The ginger took the entire time. 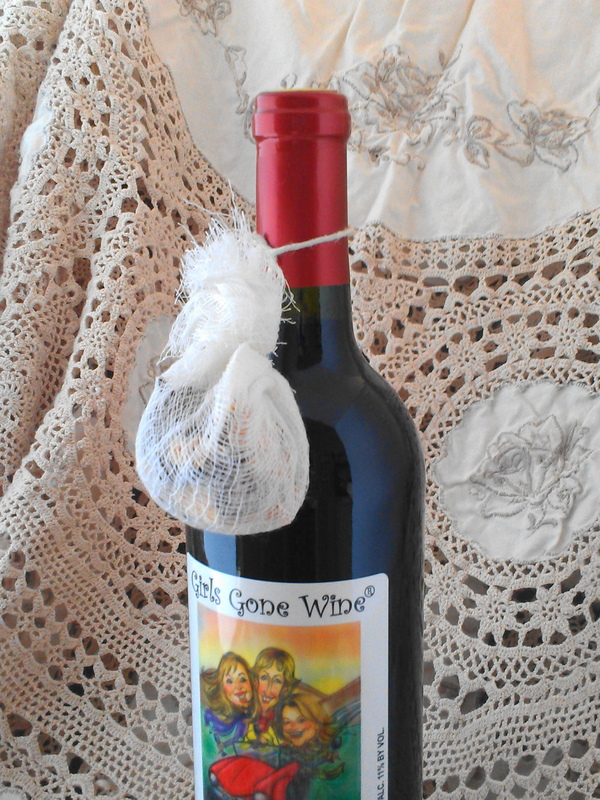 Give one of these small packets of goodness along with a bottle of old vine zinfandel or a jug of apple cider. For easier gift giving (especially if mailing or traveling), put one batch in a small jar and include some cheese cloth squares. Place ginger slices and spices in a spice ball and drop into large sauce pan with wine or cider. Float orange and lemon slices. Heat and simmer for thirty minutes. Remove spice ball and serve. Garnish drinks with the citrus spices. Really, I would bottle this smell if I could. I wish I had Smell-o-Vision for the blog. Have a pot of this potable simmering on the stove during your next holiday get-together and your house will smell warm and inviting. For some reason, I cannot get Cyndi Lauper’s “Feels Like Christmas” out of my head today. Here, I want to share the joy with you as well. Fantastic homemade spices! Very inspirational! Thanks, guys. We love that green chili mix. You are so very clever! 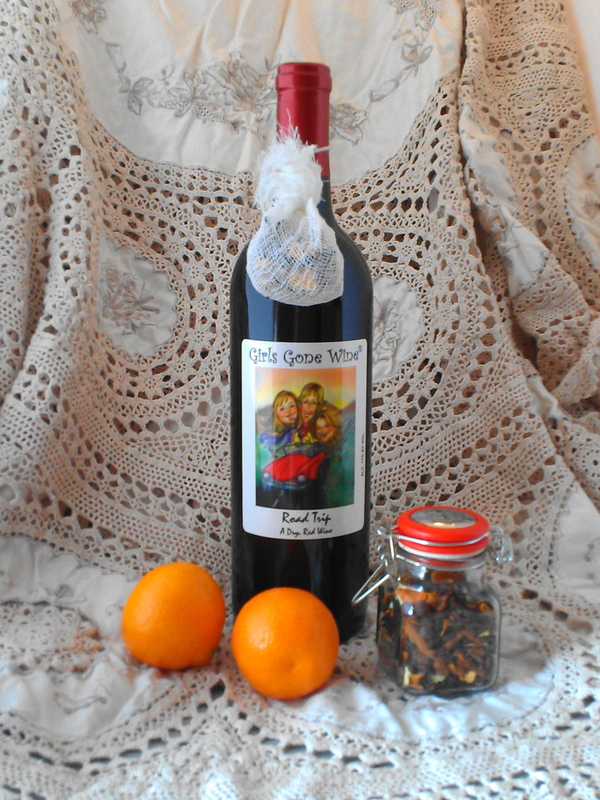 I would love this with the wine as a gift. I’ve always been one that love to give what I would like to receive. 🙂 Great gift idea! Yep, I tend to gift what I really secretly want. Thanks, MJ.